It’s a new marketing strategy from BHP to see if they can stimulate interest, and get readers to buy the remaining three volumes, all of which are also available on Kindle now, for $9.99 each. Or you can purchase the hard copies (still) if you prefer for a dollar or so more. I spoke to my editor about the whole “out of print” thing and I guess the way it works is they just continue to sell the books they’ve already printed and when they finally run out, that’s the end. As it stands, they apparently haven’t run out yet since hard copies are still available at Amazon. 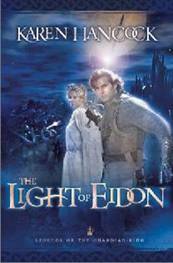 This entry was posted in Legends of the Guardian-King, Uncategorized and tagged Books, Christian Fantasy, Kindle, The Light of Eidon on May 16, 2010 by Karen Hancock. This is so timely. Last Saturday I was chatting with a friend. He was reading a book on the new iPad. I told him I still love the feel of a real book [paper] in my hand. His reply, “I cannot have one foot in each camp”…one in the old stuff and one in the new techie stuff! How cleaver of him to use those words. Reckon I have dipped a toe into the techie stuff… I do have an iPod!!! Well, I don’t have an iPod, but I do have an MP3 player. But I’m not sure I could handle a Kindle. Like you I love the feel of the book, and the ability to flip through pages and find a spot is very important to me since that’s often how I read a book in the beginning… get impatient and flip through to follow a particular plotline, then go back later and read it straight through… then go back after that and search for favorite spots! Yay!! I’ve been repeatedly requesting a Kindle edition on Amazon for a while now. I guess they got the message we want your books! Don’t be too afraid of the e-readers–I love paper books too but there are some things about Kindle that I’ve fallen in love with. I actually find it’s easier to find spots in my books because I can type in a word or phrase and if finds every time it’s listed in the book. It’s VERY helpful when I’m writing or researching, plus I can see all my highlighted sections and notes in one document. And you can still “flip” through it either by clicking through the pages or picking a random page or chapter and telling it to go there. You can always go into a Barnes and Noble and play with their e-reader (it’s called Nook) to see how it works…. But anyway. Hurray for Kindle editions! Thanks for letting us know! I read the series as it came out in print – bought them for the academic library where I work – and they have stuck with me. A few weeks ago I decided to find out if there was a Kindle version of the series and lo and behold, there were (I’ve had a Kindle for over 2 years and love it – for those not in the know about Kindle the screen does NOT look electronic – it’s as close to the look of paper as you’re going to get). Anyway, I was so tickled to find out the first one was free, and the second one was extremely inexpensive, so I went ahead and bought the entire series right then and then. I’m now over halfway through the fourth book and I’m enjoying it more now than I did the first time. I love the fantasy aspects of it but more so I love the spiritual journey of the characters (and the fact that so many events mirror similar ones in my own life – although not nearly as dramatic). All this to say – thanks for applying your obvious gifts for writing to this series and I pray it continues to touch hearts – especially the hearts of those who are running away from the truth as fast as their legs will carry them! God bless! My husband recently gave me a Kindle as a gift and the first book of the series was on the free list for Amazon. I was hooked immediately! I bought the remaining books as soon as I finished each one. I just couldn’t get enough. You weave such a wonderful store, your characters have depth and you allow us to see who they are in such a seamless way! I love your descriptions and the depth you reveal in the relationships. The way Abramm and Maddie pray has impacted the way I pray for my spouse. I have always prayed for my husband in a way I felt was already “a step above” but not with the true insight into what he needed with no regard for what I was feeling at all. I can only thank you for this touching and thoroughly enjoyable series. Now please, tell us about the next set of years of his reign as he combines his kingdoms and how Trap and Carissa’s family blossom. Books down the road could move into the younger Simon, Ian, and Abby… you have so much here to work with!